Summary: In the early 1700’s, while visiting a friend in India, Captain Van der Meer was astonished to see a baby rhinoceros wandering about the house. 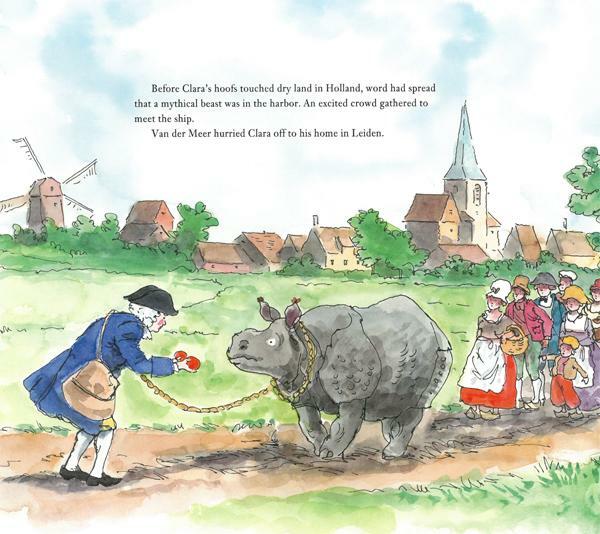 Thinking he could make a living showing her, the Captain adopted the rhino, named her Clara, and brought her back to his home in Holland. Clara proved to be a good companion, but a voracious eater, and the Captain was hard-pressed to buy her food. The two of them eventually traveled all over Europe, even getting an audience with Louis XV of France, who offered to house Clara with his menagerie (the Captain turned him down). After 17 years of travel, Clara passed away, with the Captain at her side describing her as “the greatest trouper and the truest friend.” An author’s note tells more about Captain Van der Meer and Clara, and which parts of the story have been fictionalized; endpapers show the routes the two friends traveled. 48 pages; ages 4-8. Pros: Readers will be captivated by Clara, who comes across as affectionate and docile as a large dog. 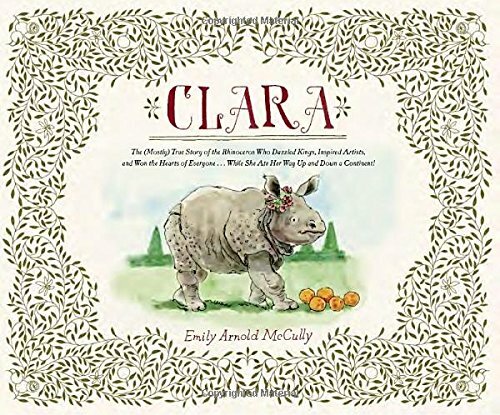 Caldecott Medalist McCully has illustrated her story with colorful, detailed paintings. Cons: Beer is mentioned several times as a staple of Clara’s diet. Love the illustrations, especially the one leading the reluctant rhinoceros! Beautiful and fanciful.